Bora Bora lies 259-km (155 miles) northwest of Tahiti in the Leeward Society Islands. Your first sight of the island will probably be from the window of an Air Tahiti ATR-72 turbojet, at the end of a 45-minute flight from Tahiti, or from the deck of a sailboat or an inter-island ferryboat. With a lagoon resembling an artist's palette of blues and greens, is love at first sight. Honeymooners and romantics from around the world have laid claim to Bora Bora where the castle-like Mount Otemanu pierces the sky. Lush tropical slopes and valleys blossom with hibiscus, while palm-covered motu circle the lagoon like a delicate necklace. Perfect white-sand beaches give way to emerald waters where impossibly colored fish animate the coral gardens. Simply said, Bora Bora is the most beautiful island in the world. Bora Bora’s Lagoon: Bora Bora’s lagoon will be your natural center of interest. An artist’s palette of blues and greens greets your eye: aquamarine, lapis lazuli, turquoise, cobalt, periwinkle, sapphire, emerald, jade, ultramarine, indigo. You’ll love counting the shades of color in these diaphanous waters. Mount Otemanu: Mt. Otemanu, a ragged remnant of a massive volcano, that juts 2,400 feet out of the Pacific, dramatically defining the island of Bora-Bora. This island's stunning beauty resulted from an ancient volcanic erosion, resulting in shark's teeth ridges rising above a narrow lagoon. Several ultra luxury resorts line these shores, many featuring over-the-water bungalows. 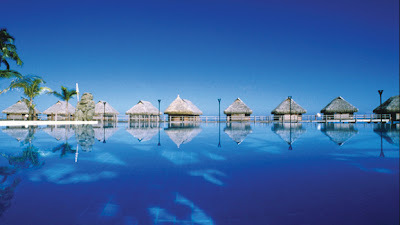 - Bora Bora's artists and craftsmen fall into a rare class of artistry. Undoubtedly, they have all been influenced by the magic of the island, and it shows in their respective arts and crafts. - Visit the ancient Maraes on and hear the heritage of the Island. - Water sports are always on hand; surfing, windsurfing, jetskiing, jetboating, waterskiing, swimming, kitesurfing. - Relaxing is always an option in Tahiti, so sit back, put your feet up and enjoy the sun!